And someone might kill you! Ever wonder who penned the perfect words to the Mother’s Day card you sent last year? Or the hilarious birthday card you gave your best friend? A master of words, that’s who. In the Netflix original film, Girlfriend’s Day, director Michael Paul Stephenson (The American Scream) invites you to experience a clever and quirky story about love, loss and the worst place to get a paper cut. 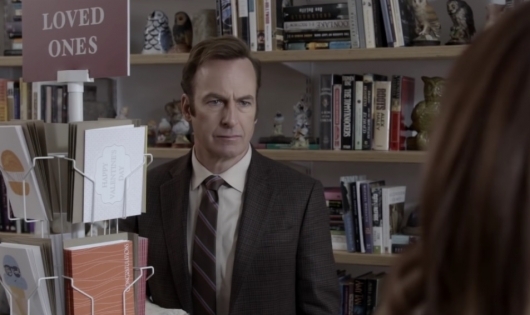 Meet Ray Wentworth (Bob Odenkirk), once a king of the wordsmith world, and now a down-on-his-luck romance card writer. In an effort to recapture the feelings that once made him the greatest, he gets entangled in a web of murder and deceit as writers vie to create the perfect card for a newly crowned holiday: Girlfriend’s Day. The film also stars Amber Tamblyn, Natasha Lyonne, Ed Begley Jr., Stacy Keach, Rich Sommer, June Diane Raphael, Andy Richter, Stephanie Courtney, Toby Huss, Stephen Michael Quezada, Derek Waters, and Echo Kellum. Girlfriend’s Day will be released on Netflix on…you guessed it, Valentine’s Day.